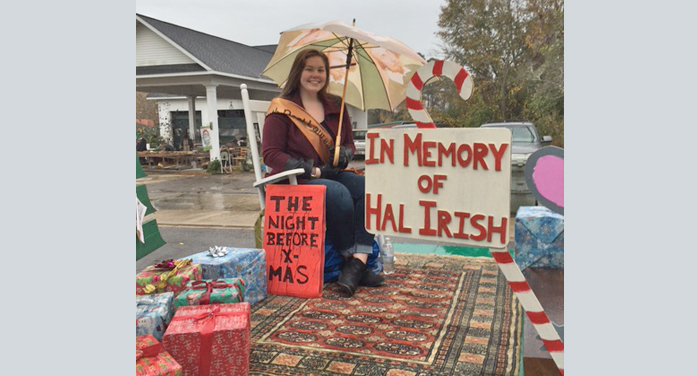 Christmas Parade: Poet Laureate Float Remembers Hal. . .
By admin on December 5, 2016 Comments Off on Christmas Parade: Poet Laureate Float Remembers Hal. . . The new Youth Poet Laureate, Jenny Boylston of Trenton, was featured on the Poet Laureate float in Sunday’s Edgefield Christmas Parade. Director of the parade, Calvin Henderson, reported in the media that there were 80 entries that showed up out of 100, even in the rain and chill, to make a great hour-long parade. “The Night Before Christmas” — an all time favorite poem recited many times by the late Hal Irish of Edgefield — called attention to the holiday through a most famous rhyme. Remembering Hal Irish, also, in connection with the induction of the first Poet Laureate of Edgefield Laurel Blossom, in 2015, he gave a delightful reading from Shakespeare. The induction was on Shakespeare’s birthday! Our Poet Laureate Laurel can be found monthly in the pages of the print edition of the Advertiser, in a corner all her own, where she places poems of the season and more.